South Carolina was supposed to be an opportunity to turn things around in the Jeb Bush campaign. Actually, it's probably more accurate to say that the Palmetto State was a last ditch effort to keep things alive. There was a Politico report last week that said Bush staffers were already calling about other jobs. This was before Saturday's decision. When did this campaign really come to an end? The presidential campaign of former Florida Gov. 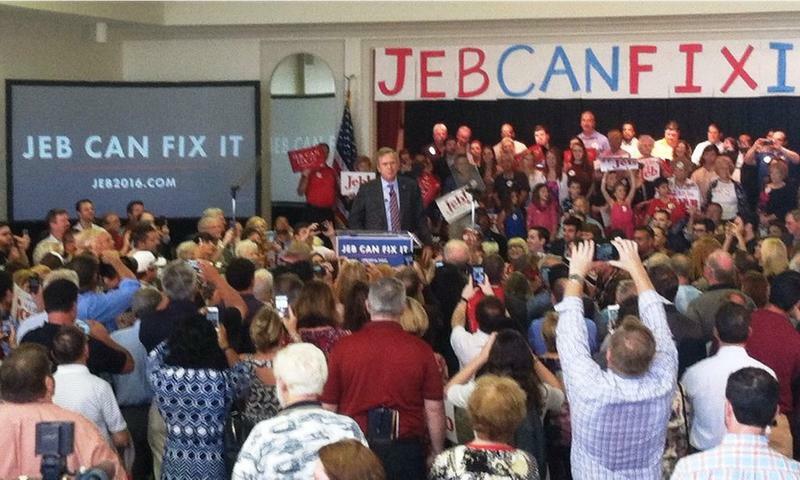 Jeb Bush has pulled out all stops in South Carolina. It’s been a family affair with the matriarch, Barbara Bush, hitting the trail and former President George W. Bush coming out of retirement to stump for his brother. That has Bush supporters, like South Florida Congressman Mario Diaz-Balart, saying calls for him to exit the race are premature. 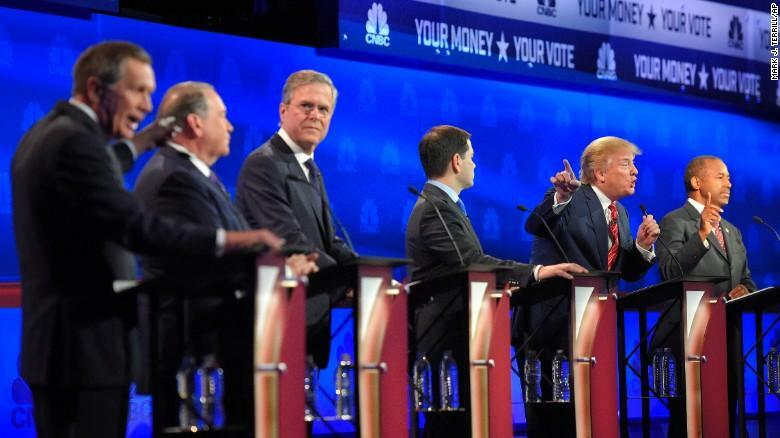 The Pope, The Border And Bush: Is This Week A Snapshot Of The GOP's Latino Folly? The last time I reported from Juárez, Mexico, about five years ago, it was the most murderous city in the world – a desert slaughterhouse for drug lords like Joaquín “Chapo” Guzmán. One evening a colleague and I popped into Juárez’s most famous bar, the Kentucky Club (supposedly the birthplace of the margarita). We had the place to ourselves. A homicide rate of more than 200 per 100,000 residents tends to depress nightlife. Tuesday is the New Hampshire primary. Among Democrats, Sen. Bernie Sanders holds a significant lead over former Secretary of State Hillary Clinton. On the other side, Donald Trump holds a double-digit lead, followed by Marco Rubio and Ted Cruz. What do New Hampshire voters want and consider their top issues? How different are they from Florida voters or Iowa voters? Patricia Mazzei, political reporter for the Miami Herald, has been following the Rubio and Jeb Bush campaigns. The issue of Iranian hostages was back in the news recently - the hostages from way back in 1980. U.S. Sen. Marco Rubio, R-Florida, brought up Ronald Reagan's role in their release. WUSF's Steve Newborn talks about that and Jeb Bush's claim that he reduced the number of teens using heroin with Amy Hollyfield of PolitiFact Florida. Relations with Iran have been in the headlines recently, with the relaxation of sanctions in light of the deal to curb the development of nuclear weapons in the rogue nation. It’s not easy to watch Rolling Stone magazine’s newly released video of Mexican drug lord Joaquín “Chapo” Guzmán answering questions sent to him by actor Sean Penn. By that I mean it’s hard to watch without falling asleep. The video offers no confessions of the ghastly narco-bloodshed Guzmán has to answer for. It’s just a ghastly bore. Before ringing in the New Year, we take a look back at 2015 national politics and politics in the Sunshine State. It was a critical year for Democrats and Republicans running in the presidential race. From spring through summer, more than 20 major party candidates started campaigning as presidential hopefuls. Four of them have personal connections to Florida: Jeb Bush, Donald Trump, Marco Rubio and Ben Carson. In his race for the White House, Former Governor Bush has hit many bumps in the road, so he’s tossing some new tires on the campaign bus. Under the new anthem of “Jeb Can Fix It,” Bush is trying to shake off some of the criticisms that have left him down in the polls. South Florida Republican Carlos Curbelo says he has no regrets about supporting Bush so early. “No not at all look I supported the candidate that I think is best prepared to be president of the United States and he’s now retooling his campaign. He’s going to relaunch it and looking forward to that,” Curbelo says. Former Florida Gov. Jeb Bush will be feeling the heat again in Tuesday evening's debate as he tries to rebound from a disappointing performance last month that renewed questions about his viability. "I think there's going to be a lot of pressure on Jeb," predicted Katie Packer Gage, who was Mitt Romney's deputy campaign manager in 2012. "He put some pressure on himself by telling people he's going to get better and work on his debate performance. I think this is kind of a make-or-break moment for him to really step up what he's been able to do in previous debates." Republican Jeb Bush's campaign revival tour is getting louder and more colorful as he charges across early voting states with a can-do slogan, a tour bus and critiques of rivals who have become threats to his claim as the GOP mainstream favorite. "We're Americans, dammit!" he shouted Wednesday at a pharmacy in Hollis, N.H., as he complained that the U.S. was not leading in key foreign policy disputes. He saved special words for Donald Trump, the former reality show star who remains a leader in the unpredictable GOP nomination fight. 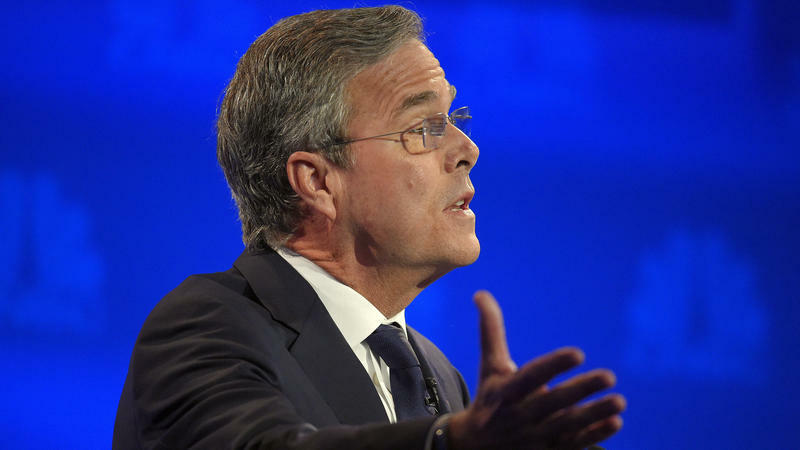 News Service Of Florida: Can Jeb Fix It? The News Service of Florida released a video in which executive editor Jim Saunders analyzes Jeb Bush’s presidential campaign. Saunders talks with Steve Wilkerson from Capital Dateline Online about Bush's campaign reboot. After seeming like a strong contender in the primaries, Saunders says the former Florida governor's campaign seems to be going unnoticed. Anyone who has watched any of the presidential debates knows the claims have been flying around fast and furious. So we're going to take on some of those claims from the recent debate in Boulder, Colorado, from the Florida-based candidates in a bit of a lightning round with Josh Gillen of PolitiFact Florida. This hasn't been the best of times for Jeb Bush - he's been getting pushback after last week's presidential debate to drop out of the race. But during a speech Monday at the Tampa Garden Club, Bush said he's sticking to his long-term plan to win the White House. When Marco Rubio was asked at Wednesday's Republican presidential debate about the South Florida Sun Sentinel's editorial that called for his resignation as Senator, Rubio was prepared. "I read that editorial with great amusement," Rubio said. The editorial board slammed Rubio for a poor voting record at Capitol Hill, which is among the lowest this year. 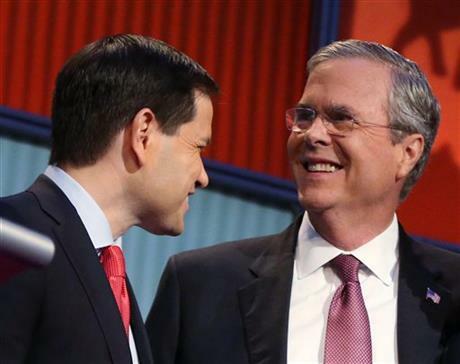 Can Rubio's Lean Campaign Keep Up with Bush's Behemoth? 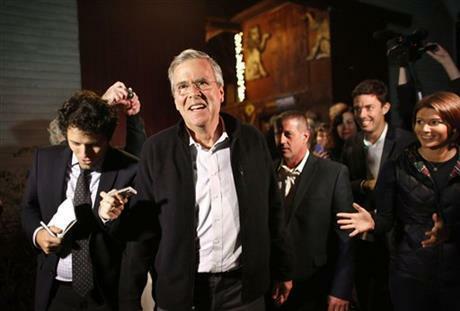 Hundreds of donors to Jeb Bush's presidential campaign will gather later this month in Houston. They'll shake hands with a pair of former presidents, and high-profile lieutenants of the former Florida governor will push them to write generous checks. This weekend in Las Vegas, dozens of donors met up with Marco Rubio. They ate fast-food hamburgers, shook hands with a celebrity pawn-shop owner and played flag football with the Florida senator.